Do you have those foods that at one point you absolutely detested and would avoid any dish at the mention of their name? Yeah, me too. But the number's gone down drastically in the past ten years. But there was a point in my life when, unless I didn't know it had eggplant in it, or it was nice and creamy like kashk-e bademjan, I wouldn't touch it. Just the thought of it grossed me out. It was gross and bitter with a weird texture. Clearly, my opinion on eggplant has changed. 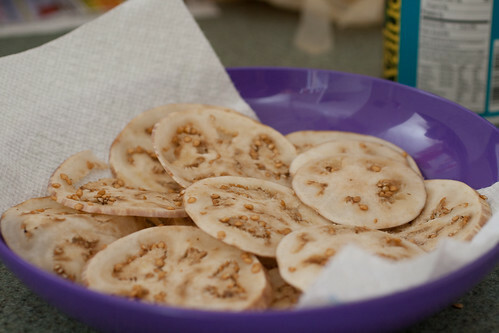 I get super excited whenever my dad roasts eggplant on the grill knowing it means some sort of delicious garlicky eggplant dip is in my future. My mouth waters at the mention of fresh eggplants from my aunt's garden. And at the sight of gorgeous graffiti eggplant from a nearby farm at the grocery store for 99 cents a pound, I can't help but grab a gorgeous globe, just thinking of what I can do with it. And then, I find out, that like me of the past, my roommates all detest eggplant. One will only touch it if it's deliciously fragrant and disguised, which isn't something I've mastered, and another is allergic, which is an acceptable excuse. Leaving me to come up with something easy and simple for one. And with my failure of planning while at the grocery store, I didn't have much to work with. I thought about making a pan-fried eggplant sandwich with carmelized onions, and somehow that turned into a really ugly, but tasty, dish. 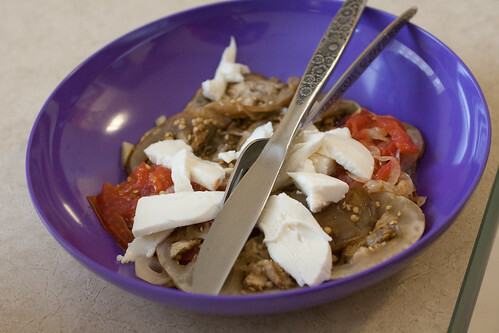 Layers of thinly sliced eggplant and tomatoes topped with garlicky sauteed onions and fresh mozzarella. Yum!